A home remodel project typically manifests itself due to a growing family or a portion of the home that is in need of repair or modernization. Whether your home remodel project is building a home addition, or remodeling a kitchen or bathroom, all home remodel projects require careful planning to be successful. Planning a home remodel project starts with developing a set of house blueprints, or modifying the existing set of house blueprints that were used to build the home. With smaller home remodel projects, such as updating a bathroom, a simple set of sketches may be all that is necessary. 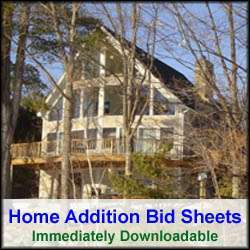 However, for larger home remodeling projects, such as building a home addition onto the side or back of an existing home more significant house blueprints are typically necessary. To create a set of house blueprints for your home remodel project start by taking a few pictures of the existing home and then drawing some sketches of your proposed home addition. The blueprint sketches should include house floor plans, and a number of outside finished views from different viewing perspectives, e.g. front, back, and sides. With pictures and sketches in hand you can contact an architect to develop a full set of house blueprints. The full set of house blueprints will include in addition to floor plans and outside finished views of the addition, cross-sectional views of the construction of the home addition. It will also show what type of materials will be used and how it all ties together. The blueprints can also call out all of the various interior finished components of the home addition if so desired, however they are typically not necessary for pulling building permits. If your home remodel or addition project is relatively straight forward, (e.g. a simple roof structure and ties in easily to the existing home), you can also include in your own sketches cross-sectional views of the construction of the home addition. Along with dimensional information and construction material listed, this is typically all that is necessary to successfully pull a building permit. Consequently, if your home remodel project is relatively simple in construction you may be able to avoid an architect altogether. In addition to a set of house blueprints, it is also necessary to develop a detail build plan schedule with projected start and stop dates for each phase of the project. To develop a build plan schedule first generate a list of all of the various tasks that need to be performed to build the home addition. By developing this list of tasks you can then begin to put a timeline together. Start and stop dates can be added as you contact the various home remodeling contractors and obtain home remodeling quotes. For each of these you should determine the specific make and model you want for your home remodel or home addition project. In addition, you should order many of these items well in advance to ensure that they do not impact your build plan schedule. Kitchen cabinets, for example, can take 8-10 weeks to receive after placing the order. So with these three key home remodeling planning components in place; a set of house blueprints, a home remodel build plan schedule, and a list of key building materials, your chances for an on-budget and on-schedule home remodel project are improved immensely.